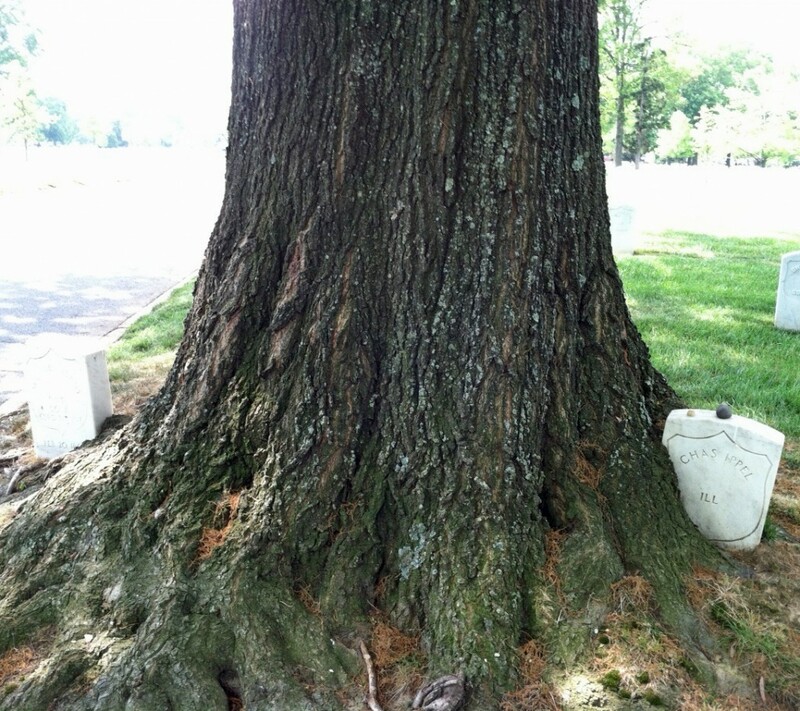 I wrote about a tree in Arlington National Cemetery that nearly overtook a grave. But I came upon the tree from the opposite angle recently and there was a second grave tucked in the other side of the tree I hadn’t seen. Wow, how did I miss that? 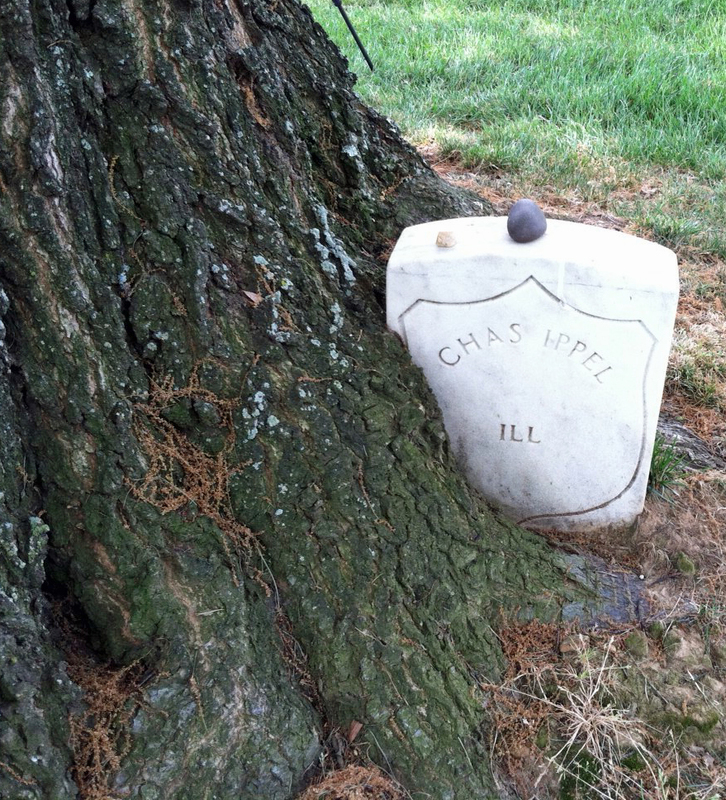 So this is the story of Corporal Charles Ippel, whose headstone is nearly completely covered by the oak tree. That Ippel died on July 26, 1863 and Michael Burns died on Feb. 20, 1864 means the tree in between grew afterwards. At least, I hope so. Ippel was a member of the 82nd Illinois Volunteer Infantry, which was all German, and Company C, which was all Jewish. He enlisted in Sept. 26, 1862 with papers saying he was from Chicago, married and worked as a cooper. Ippel immigrated from Antwerp, Germany on Nov. 4, 1848 at age 21 through the port of New York. Military records show Ippel died on July 26, 1863, three weeks after the “Second Hecker Regiment” fought at Gettysburg after an earlier engagement at Chancellorsville. No reason was given. As written earlier, Burns buried on the other side of the tree was in the Union Army’s 36th Regiment, A Company from Buffalo. Born in Ireland in 1834, Burns enlisted May 13, 1861. The private received a disability discharge on Oct. 30, 1862 in Washington, D.C. The separation papers list “Surgeon’s CTF at Washington, D.C.” as the reason. I wasn’t able to determine what that meant. He died on Feb. 20, 1864. This entry was posted in Arlington National Cemetery and tagged 82nd Infantry, Arlington National Cemetery, Best Arlington National Cemetery walking tours, Charles Ippel, Civil War, graves in a tree, Michael Burns, Photos by Rick Snider, Second Hecker Regiment. Bookmark the permalink.